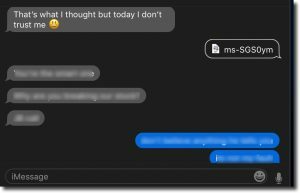 Images in Messages App are broken – Fixed! You can put me in the long time Mac/iPhone user group. Not only do they make excellent hardware – Apple really goes to extraordinary lengths to integrate the software and user experience. A Macbook Pro has been my daily driver for work for nearly 3 years. Using a Mac all day every day is very enjoyable; but one little irritation has nagged at me. Images in the Messages MacOS app are broken! The image would never appear. An icon with a filename would appear but that was it. At first I thought it was probably the corporate VPN connection that might be blocking them. Work had me so busy, I just ignored it and opened my phone each time a message with a picture came in. Today there is more work than ever to do; but for whatever reason – I really had to scratch that itch this time! After some experimentation the solution presented itself! The Messages app stores incoming images in a folder (Library/Messages/Attachments). Upon examining my system, I found a zero byte file (/Users/your-user-name/Library/Messages/Attachments). That seemed pretty odd. A bit of searching and I found an article on the Apple Communities site. Remove that file and create a directory with the same name. When you restart Messages any new messages with pictures should work just fine! There is no obvious way for Messages to clean up the Attachments folder. It might be a good idea to clear that out once in a while – particularly if you use your computer for work <privacy> or have images you don’t wish anyone to see </privacy>. When you restart Messages any images already in your text streams will remain broken. Since the folder didn’t exist when they were recieved there was no way to cache them.